It’s French composer Pierre Schaeffer’s birthday, and if you’re using any form of sampling, it’s worth pausing to remember him. At 105 years of age, he’s more relevant than ever. As it does with a lot of us, Msgr. Schaeffer’s musical career begins with messing around during his day job. (After a fashion, anyway.) 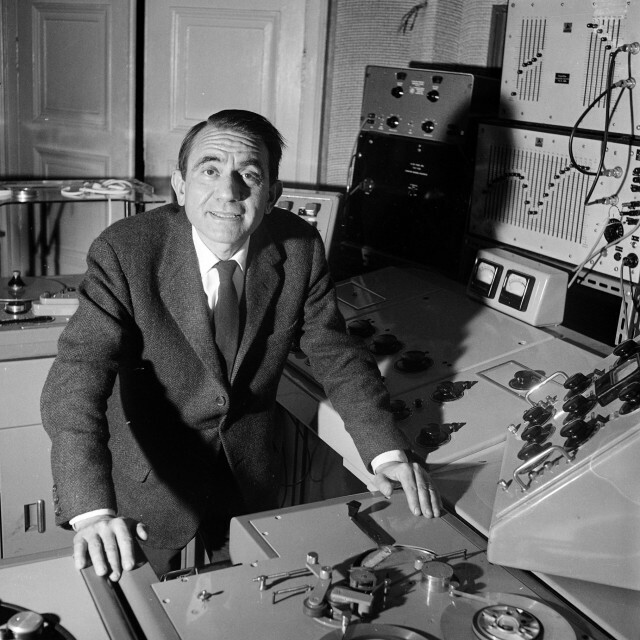 That is, while Pierre Schaeffer began his career in telecommunications, it’s when he convinced Paris-based employer Radiodiffusion Française to let him muck about with the equipment that history was made. As a pioneer of musique concrète, he used tape recording and phonograph equipment to transform speed and pitch, play sounds backwards, and produce collages by combining unrelated sounds. We now take such techniques for granted – not only in sampling, but live performance and DJing techniques. It wasn’t just introducing the technological technique that mattered, though, but spinning that experiment (“hey, what happens if I do this?”) into music compositional ideas and a theory around their form. There, enter the notion of musique concrète – and the universe we inhabit today, one in which any sound can become the basis of music. Schaeffer’s achievements are stunning – especially in clear hindsight. He founded the Groupe de Recherche de Musique Concrète (now GRM and still active), laying the groundwork for experiments to come, produced vital early compositions (including with Pierre Henry), taught students in composition. He fought for the idea of music that came from sound (that’s the concrète bit) as opposed to music via the intermediary of music notation. And as such, by suggesting we could go beyond those symbols and their reproduction by musicians, he more than arguably anyone else introduced the idea that the musical idea could be different in the age of the machine. In fact, perhaps the world is more ready for that idea now than it was in his lifetime – or even a few years back. Now that anyone with a computer or even a phone can replicate these techniques and go far beyond what was originally possible, now that billions of people have heard the resulting sounds, it’s possible to imagine a musical practice as radical as the technologies of the 20th Century themselves. What was once avant garde theory is now everyday reality. And if you use a sample, or a field recording, if you start to assemble your musical ideas on a computer without scrawling on paper, if you basically do any of the things we do every day, you’re diving headfirst into the world he had seen in his dreams and theories and experiments. So, sound off: what have you got of interest from Schaeffer’s career? Here’s a place to start. Tim Hodgkinson interviewed the composer in 1986, in English. So it seems that one of two things can happen in a period of high technology; either technology itself seems to come to the rescue of art – which is in a state of collapse – (that was my starting point, musique concrète with the tape-recorder, now electronic music, etc), or it’s the ideas of technology, ideas from mathematics, ideas with a scientific aura, or real scientific ideas given an unreal relevance to an art which is seeking its discipline – its ordering principles – outside itself instead of within the source of its own inspiration. This coincidence of a music which is debilitated and failing and a glorious, all-conquering science is what really characterizes the 20th century condition. But this is important, too – Schaeffer takes a very different approach to the one I heard from Morton Subotnick talking to him last month (that interview is coming soon). Whereas Subotnick argued for an entirely new music – and even suggested (and I happen to disagree with this) that jettisoning the keyboard on the Moog was the solution – Schaeffer argues for synthesis. He uses Bach as the example, that the baroque (essentially hacking things together, in French) is all about patching things together. Bach lived in a moment of synthesis, in terms of the instruments, the theory—tempered scale, etc.—and was putting everything together. He was taking from the Middle Ages, from the new developments in the instruments of his time, from the Italians, and he made a music which was so clearly made up of bits and pieces that it called itself baroque. Simultaneously traditional and new. And this applies today; it will be when our contemporary researchers abandon their ludicrous technologies and systems and ‘new’ musical languages and realise that there’s no way out of traditional music, that we can get down to a baroque music for the 21st century. There’s more; I suggest checking the whole interview. Got some musique concrète inspiration to share? Sound off in comments. Thanks to Alexander Lakein for this suggestion.